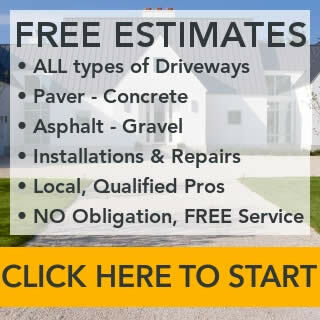 It can cost thousands of dollars to install a new paver driveway on rural property or replace an existing one; and yet smooth and dependable access to our homes is something we can’t really do without. 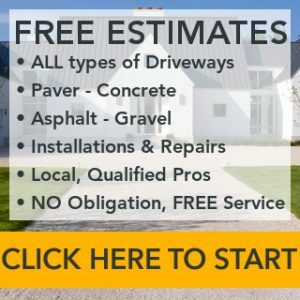 Are we stuck paying the professionals what seem like exorbitant amounts of hard earned money to install lovely asphalt or concrete driveways, or are there cheaper alternatives? This is a question that Lady Lee, an avid homesteader and DIYer asked herself after she and her husband bought their dream property: twenty acres of farmland. Their new property had no direct access and was, for a while, available only via a neighbor’s roadway. Over time shared driveways do not good neighbors make (right of way, easements, rights to access can become a legal quagmire) so a decision was quickly made to build their own driveway. Most people think that would be easy and relatively cheap to accomplish. Just throw down some rock and gravel and call it good. But as Lady Lee will tell you here on her homesteading blog it is not that easy and it most certainly isn’t cheap. 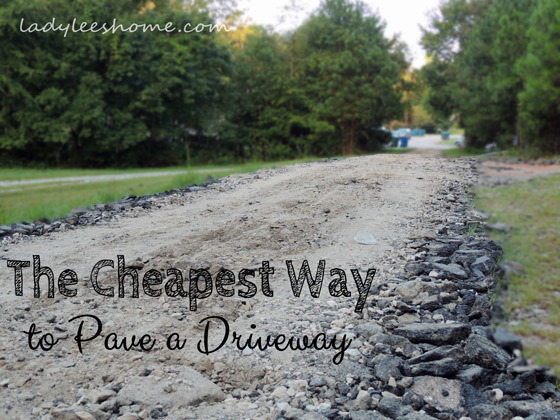 Obvious choices for a driveway such as concrete, asphalt and pavers were immediately out of the question and the cost of “some rock and gravel” (otherwise known as railroad ballast and crusher run gravel) quickly added up. A truckload of stone costs between $350 and $400 and will only cover about 50 feet! Worse, you need at least two layers of railroad ballast, depending on how packed the ground underneath the project is; and at least two layers of crusher run gravel is required on top of that. You need a grader and its operator who can spread this stuff out evenly because it isn’t humanly possible to rake it out yourself! Unless you happen to be Hercules, that is. So what was Lady Lee going to do? Compromise first off. 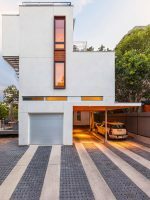 While her ideal length of driveway was 400 feet, she soon realized that cutting down the length would slash her costs considerably. 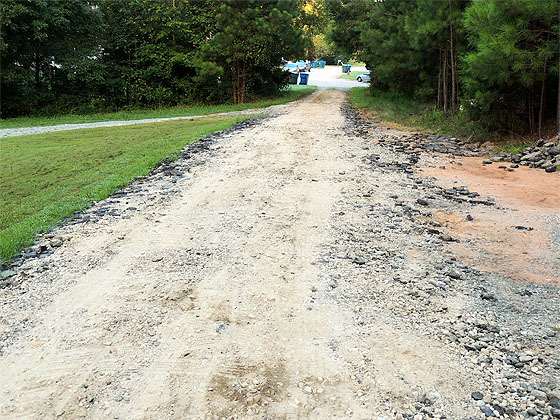 She and her husband decided on a fifty foot driveway; which would allow them to park their RV and any vehicles they brought to the property safely away from the main road. The first obstacle they encountered was a ditch that ran alongside the road at the entrance to their property. A fifteen inch concrete pipe had to be installed in the ditch before anything else could be done. The cost of this item was almost $400 dollars, but the local Department of Transportation folks could install it free of charge as long as Lady Lee could wait a few days. She could. Normally it is necessary to scrape out a bed for the driveway in the ground; Lady Lee and her family were able to forgo this step partially because their property featured hard red clay ground and a couple of loads of railroad ballast could be laid atop the ungraded clay with no problem. They ended up ordering two loads of ballast, so that they could widen the farthest end of the drive to allow them to maneuver and park their RV (which they would need to use as a base of operations for the construction of their future home.) They paused the project here to allow the ballast to settle. They had already invested $1000 into the driveway and it wasn’t done! 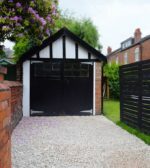 A visit to friends in Virginia turned into a timely and cost saving solution to the problem of how to finish their driveway and to expand it at nominal cost. Read how it all came about at the link above!